Add my delicious but healthy Baked Turkey Meatball recipe to your menu plan this week. 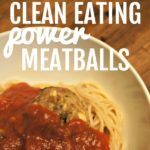 This clean eating recipe for turkey meatballs is super simple to make and packs tons of flavor without the guilt of being high in calories. A great dairy free and low carb recipe that is versatile enough to be served on a sandwich, in a soup or topping your favorite pasta. I love trying out new ways of cooking classic comfort foods. Trying to eat a clean diet can be hard when so many of my favorites aren’t exactly compliant. This clean eating recipe is one that will knock your socks off. Your taste buds will thank you for making our super simple baked turkey meatball recipe. 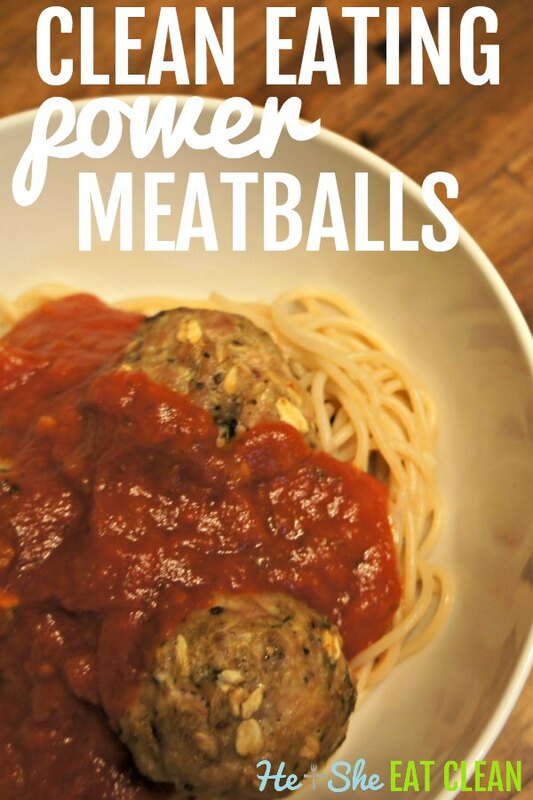 Grab a clean pasta sauce like Monte Bene and some brown rice pasta and make these meatballs. You are definitely in for a treat! While you can use ground chicken for this recipe, I prefer the taste and texture of ground turkey. When making these baked turkey meatballs, you may have to get your hands a bit dirty, but I have an awesome trick that you will love! Use your stand mixer with dough hook to mix the ground meat and seasoning mixture to keep your hands clean! Make double batches, and freeze part of the meatballs on a baking sheet raw. Leave in the freezer for 1-2 hours or until solid, then pop them off the baking sheet and into a freezer bag for later. Just drop them onto a baking dish and bake for an extra 15-20 minutes when ready to make them again. You can always serve these turkey meatballs over pasta with your favorite sauce. If you are like me though, you love thinking outside the box a bit. Below are some different ways you can fit this high protein option into meal time without fuss. This baked turkey meatball recipe is going to become a favorite in your house in no time. I love using ground turkey in recipes to really cut back on the high-fat proteins. Below are some of my other favorite ground turkey recipes for you to consider adding to your meal plan because I know you will love them too for dinner. This was originally published on November 12, 2013, and updated March 12, 2019. Made these (again) tonight! Love them! Thanks for sharing! This was an awesome recipe. My kids, who aren’t big meat eaters, devoured them… and I doubled the batch. Lol. Thank you so much! These meatballs are awesome! I added some sugar-free barbecue sauce and they were so good!!! Just made these! Added half of a small onion and these are amazing!!! My trainer suggested a clean diet and this was the first recipe I tried. These were AMAZING! I am completely on board with clean eating now. Thanks! I used oat bran instead of oats and they came out great! If you don’t like the texture of oats in your meatballs. I just made these tonight and they were great, easy, and my kids loved them. Thanks again for the great recipes! I really love the easy quick ones the best. Yum! I like having meatballs on hand for some convenient protein. What a filling recipe and an excellent one to use for “winter” 🙂 I love that turkey or chicken can be used- I am a fan of the chicken! Love this recipe! It’s a clean recipe my husband actually likes, so that is a definite win! I make these weekly. I have been a huge fan of these for years! This recipe tastes great, is super simple, no one knows they are “healthy”, and you can easily freeze for later. Love them! We love meatballs and this recipe is so yummy!